Why take a genre that nobody cares about anymore, throw millions upon millions of dollars at it, and hand it over to a pair of oddballs - one of whom who seems dead-set on playing dress-up? You’d be an idiot to do so - unless you’d pulled it off before. Unlike critical and commercial darling Pirates of the Caribbean: The Curse of the Black Pearl back in 2004, however, Gore Verbinski and Johnny Depp’s latest collaboration for Disney, The Lone Ranger, has crashed and burned - and that really is a shame. Its perceived and rather unwarranted failure means that we’ll probably never see a western produced by a large studio as simultaneously sumptuous, off-kilter, interrogative, and spectacular as this ever again. John Reid (Armie Hammer) is an upright young city lawyer from the city. He’s like Jimmy Stewart in The Man Who Shot Liberty Valance (1962), only with a bigger chin (it’ll look better under a mask). He’s just moved to Texas, where the development of a new railroad by tycoon Latham Cole (Tom Wilksinson) is being complicated by the neighbouring Comanche. Meanwhile, John’s brother is killed in a shootout by cannibalistic outlaw Butch Cavendish (William Fichtner) and his gang, from which John is rescued by a mysterious Comanche called Tonto (Depp). This enigmatic stranger has his own reasons for tracking down Reid’s brother’s killer - whom he refers to as the Wendigo - so he and Reid set to tracking Cavendish down. In doing so they come across a trail drenched in the blood of the innocent - and it’s not the Comanche who are to blame. The Lone Ranger’s framing device, set in San Francisco circa 1933, shows a withered, rugose Tonto telling a young boy dressed as the Lone Ranger a horror story about white imperialism, unrestrained capitalism, and the banality of evil. In this the film recalls the revisionism of Arthur Penn’s Little Big Man (1970), where a heavily-made up Dustin Hoffman regaled audiences with his experiences at the Battle of Little Bighorn. The Lone Ranger is a revisionist Western in this mould - intelligence sits alongside goofiness, but there’s always anger bristling on its sardonic lips. Depp’s portrayal of a Native American seems to have been attacked more by people who haven’t seen the film than by people who have (this seems to be the case regarding anything that has been said about The Lone Ranger), but it’s a fine, subtle performance and there's a point to it. The film criticises the building blocks of American civilisation, symbolised by the railroad and the copy of John Locke’s Two Treatises of Government that Chinny Stewart clenches in his hand like a bible, before dropping it in favour of a mask that symbolises real justice. 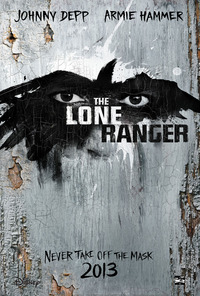 Once the Lone Ranger hi-hos Silver, slapstick set-pieces reminiscent of Buster Keaton’s The General (1926) abound. These action sequences are marvellous in their intricate geography and are shot with wit and clarity. What is most shocking about the derring-do in The Lone Ranger, however, is that it’s never actually given the opportunity to feel particularly derring. Heroics sit alongside - and, à la Eisenstein, are sometimes intercut with - shocking scenes of genocide on the part of white settlers. The humour here is as dark and as directed as sour tobacco being spat into a spittoon. It’s not a light-hearted romp, and the more I think about it, the less I’m surprised that people didn’t go to it in droves. This caustic film carries its burden - as it should do.